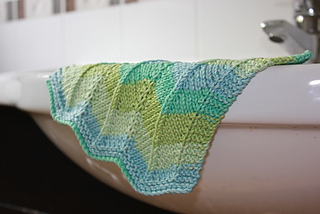 Designed for worsted (10 ply) but easily knitted with DK (8ply) using smaller needles. 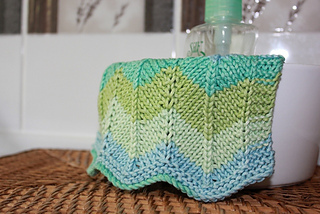 I love easy dishcloth patterns! I love knitting them when my motivation for knitting and designing is waning. I love giving them to people who I think might appreciate hand-made presents they can use daily! This is a mindless pattern, very easy to knit and remember after a few rows, simple enough to be able to knit errorless when catching up at your knit night or travelling in the car. And everyone loves a zig-zag right? A great way to use up remnants too. This pattern and the others in the collection (Blanket and Scarf) are being released as free patterns and are able to be knitted for sale. You may use this pattern for small scale commercial purposes, making items personally. Please credit any items you knit for sale back to this pattern and Julia Stanfield as the designer.